My happiest place is home, at my family’s house, sitting around our backyard fire pit on a fall evening. You know that scent. You're taking a walk, kicking up leaves. “Smells like someone is having a fire,” you think. I love it. Ash, crackle, blaze, fire, s’mores. When I was in high school this was the weekend gathering I always looked forward to. A few of my brother’s jock friends, his girlfriend (my best pal), my parents, a box of graham crackers, king size chocolate bars and a bag of jumbo mallows. As night fell, we’d bundle up against the chill, grab the supplies and trek to the side yard. My dad would tease my brother as he tried to build a fire, mom made sure everyone was warm and toasty, I poked around for roasting sticks, just happy to be there, to be with these people. Looking back now it seems childish; but when you are in high school, everything seems like the end of the world. He dumped me, I failed that, she talked behind my back, this sweater-vest is making me sweat, I didn’t make the team. I’ve lost my Five-Star. Who am I? Do people like me? Taking a sticky bite of that s’more, seeing our faces smudged with chocolate, being with Mom and Dad in this carefree moment, always made my real and imagined stress just melt away. 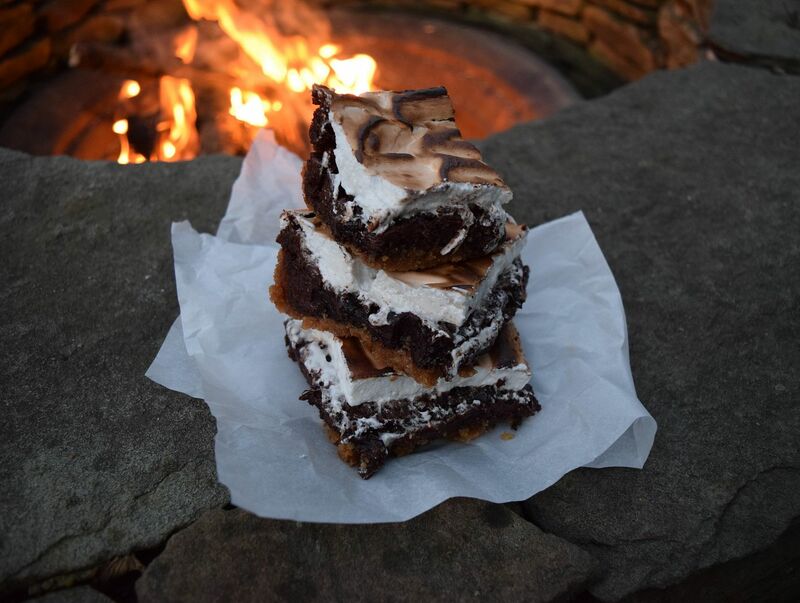 So, as an ode to those fire pit Fridays and the s’mores of days past, I created these s’more brownies. Crunchy graham, melty chocolate, gooey marshmallow – and just as toasty as the classic. And hey, no fire pit! No problem! Get friends to stand by as you pull them out of the oven. 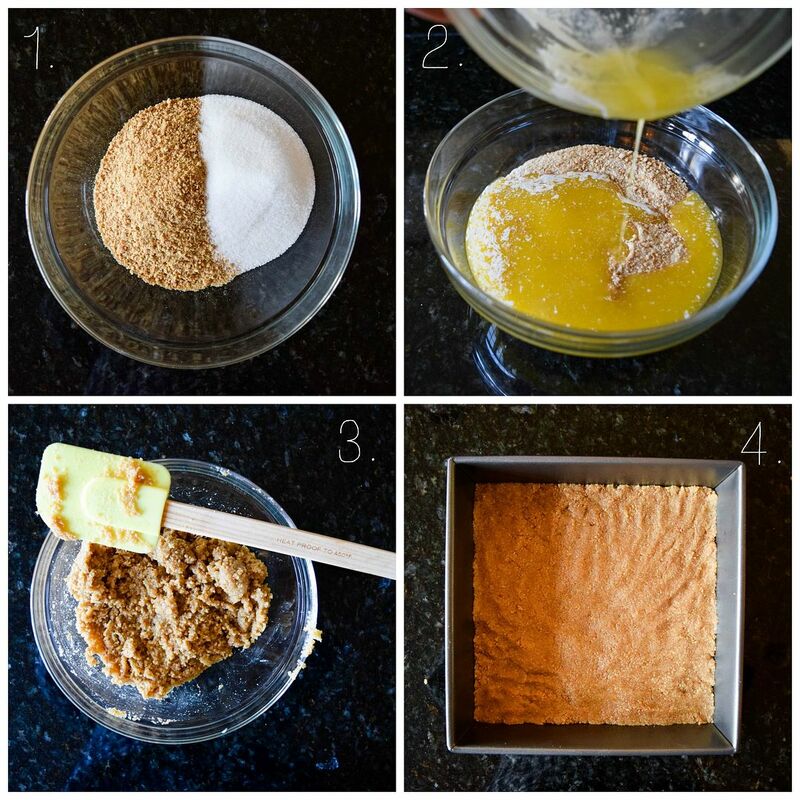 To make the graham cracker crust, mix together the cracker crumbs and sugar. Add butter and stir until the mixture comes together. Press the gramham cracker crust mixture into an 8 x 8 inch pan. Set aside. To make the brownie layer, whisk together the flour, cocoa powder and coffee powder in a medium bowl. In the bowl of an electric mixer, cream together the melted butter, sugar and the vanilla. Add the eggs one at a time, scraping down the bowl with a spatula between each addition. Add the dry ingredients in 2 – 3 additions, scraping down the bowl after each. Leave 1 tablespoon of dry mix behind to toss the chocolate chips in. Mix until just combined. Toss the chocolate chips in the reserved dry ingredients and then mix into the batter. The coating of dry will prevent the chips from dropping to the bottom of the batter. Spread the brownie batter on top of the graham crust and place in the preheated oven. Bake for 20 – 25 minutes, rotating the pan halfway through the baking time. The brownies are done when they have pulled away from the pan and when a toothpick is inserted it comes out mostly clean (maybe a few wet crumbs). To make the marshmallow topping, put a pot with a few inches of water over medium heat and bring to a simmer. Place the egg whites and sugar in a heatproof bowl. Set the bowl over the water and whisk the egg and sugar together vigorously. Cook until the eggs are warm to the touch and foamy. Transfer the eggs and sugar to the bowl of an electric mixer fitted with a whisk attachment. Add the cream of tartar and vanilla. Put the mixer on high and whip until the mixture forms soft peaks, about 6 – 8 minutes. Preheat the broiler. 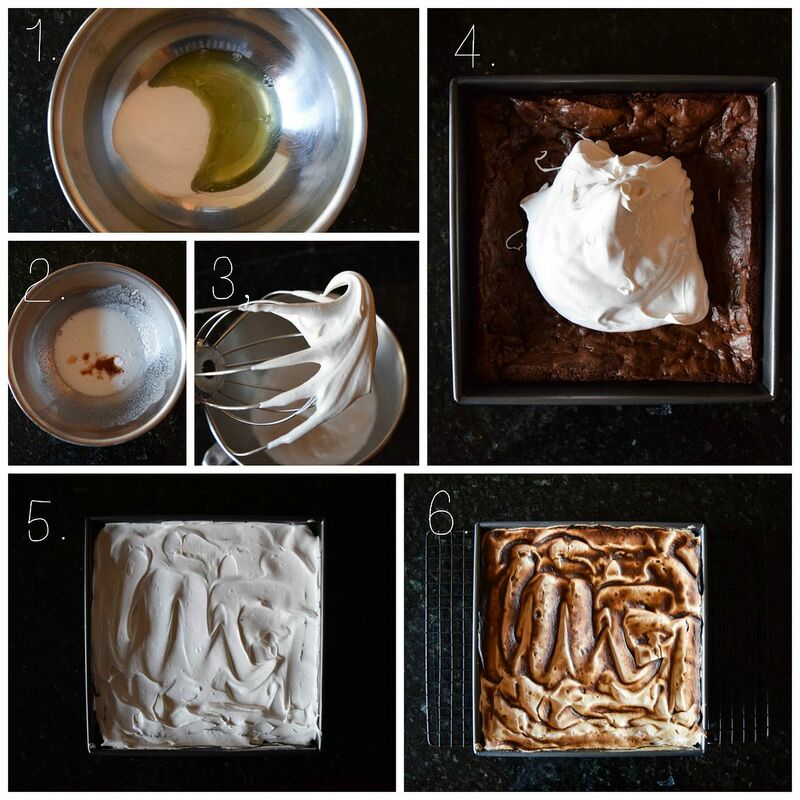 Dump the marshmallow on top of the cooled brownies and spread into an even layer. 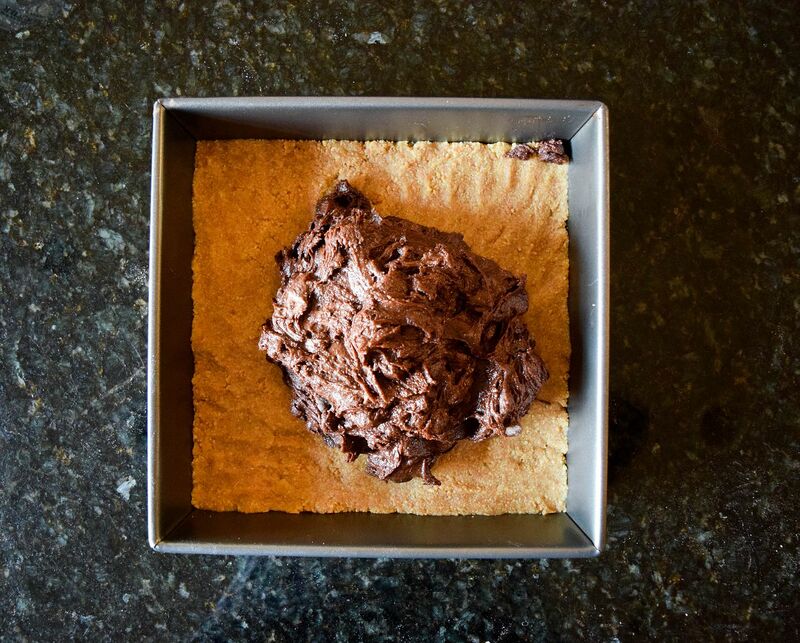 Place the brownie pan under a broiler for 2 – 3 minutes until the marshmallow is toasted. Do not walk away, this process happens very quickly! Let the brownies cool then slice and serve!